Love. Magic. Revolution…Gita Trelease’s debut fantasy about an orphaned girl who uses dark magic to save her sister and herself from ruin is a “must-have” (School Library Journal, starred review)! 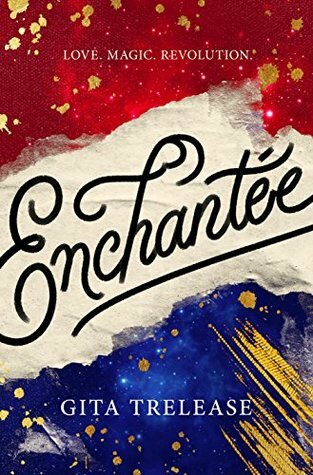 Enchantée by Gita Trelease is a young adult historical fantasy that takes place at the time of the French Revolution. While the book has events and figures from this time in history it is a fantasy read with the use of magic being involved with the characters. Camille Durbonne’s family had never been rich but when her parents both pass away from smallpox Camille and her siblings are left to fend on their own. Camille’s older brother however only gambles away any little bit he gets a hold of and is often abusive to Camille and her younger sister. In order to protect herself and her sister, Sophie, Camille begins to dabble in the dark magic that had always been forbidden. Instead of only turning bits of metal into coins to survive Camille begins to transform herself to pass as a baroness to enter the high stakes gambling in the Palace of Versailles. First for the positive side of this one I would readily admit the author did a good job incorporating magic into the historical time frame and bringing it all to life. However, with this one being close to 500 pages yet again I felt as if it just wasn’t going anywhere. I’m not a huge fan of such a slow burning story and want way more action happening than I found in this one. While this one was just so-so to me though I’m sure those that prefer a slow build would love it. Born in Sweden to Indian and Swedish parents, Gita Trelease has lived in lots of places, including New York, Paris, and a tiny town in central Italy. She attended Yale College and New York University, where she earned a Ph.D. in British literature. Before becoming a novelist, she taught classes on writing, monsters, and fairy tales—some of which have seeped into her stories. Along with her husband and son, Gita divides her time between an old village in Massachusetts and the coast of Maine, where she’s still searching for a secret portal that will take her back to Versailles. Thanks Shalini, most of the time my patience wears thin with very little going on but there is the rare occasion that I enjoy the characters or setting so much that I don’t notice, for 500+ pages though I just needed more. Hym… I’m not thrilled to read that this is a bit of painful slow read, I’m curious about this book, the story seems interesting but I rather read something packed with action. I definitely wouldn’t call it action paced, it’s good for the historical feel of the story but I would have like so much more to happen than there was.